Provided below are 2011 recycling tonnage reports provided by individual recycling markets as well as the MCMUA. These reports are useful for municipal recycling coordinators while completing their annual recycling tonnage reporting forms. 2011 Recycling Tax ($3/ton) Paid By Towns in Tipping Fees (PDF File) - This report lists the $3/ton recycling tax collected by the MCMUA in 2011 on the solid waste accepted for disposal at the MCMUA transfer stations. This money was then sent to the Treasurer of the State of New Jersey in accordance with the Recycling Enhancement Act. The report only provides information for those towns that pay the tip fee directly to the MCMUA using their municipal accounts. If a hauler is paying the disposal tip fees directly, then you will have to get this recycling tax collected from each respective hauler. You can use this report to fill out the certification in the municipal recycling tonnage grant process that requires each town to certify the amount of money paid as part of the $3/tax. 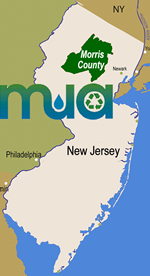 The first report shows tonnage delivered to the MCMUA's Recycling Consolidation Center in Dover. It provides a detail listing of all loads delivered by material and by municipality (There is a second version of this report that further breaks down the activities by recycling generator in each town). Just print out the pages that are applicable to your municipality. Additionally, these report are mailed to Morris County municipal recycling coordinators toward the end of February. Listed below are the abbreviations and the entire name or description of each material used in these reports. * Please note that aluminum, plastic bottles, glass, and tin/steel appear as CMG (commingled). Also, MIX consists of various types of paper. The percentages for these categories are listed below. For Single-stream recyclables, the percentages are calculated on premise that 60% of the material is paper and 40% is commingled bottles, cans, plastic, etc. (CMG). 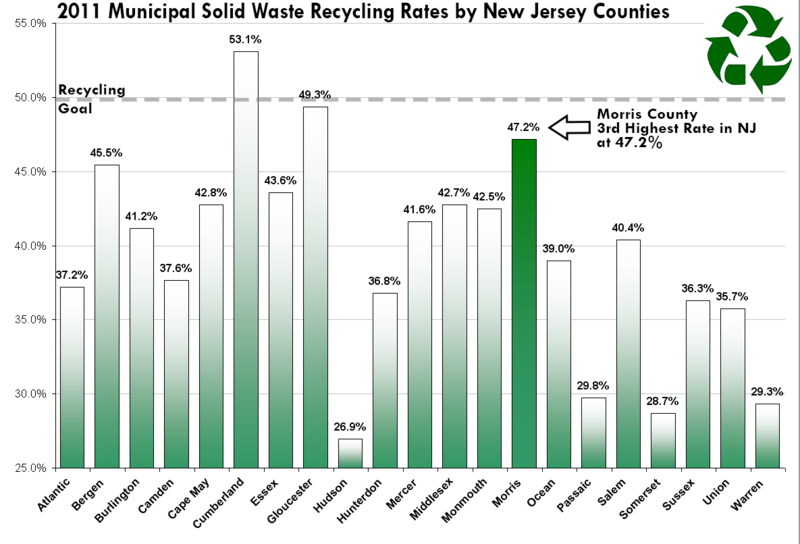 Note: The mixed paper percentages are based on tonnages from the MCMUA Recycling Consolidation center in Dover for the first half of 2011 and the ReCommunity Recycling facility in Mine Hill for 2nd half of 2011. Note: For Single-stream recyclables, the percentages are calculated on premise that 60% of the material is paper and 40% is commingled bottles, cans, plastic, etc. (CMG). This 60%/40% single-stream split is based on historic dual-stream composition from 2010. MCMUA 2011 Scrap Metal Recycling by Town - (PDF File) - This report shows shows scrap metal recovered at the Mount Olive transfer station. Scrap metal was recycled at George's Salvage of Newton, NJ. MCMUA 2011 Tire Recycling by Town - (PDF File) - This report shows tires that were collected by the Morris County Mosquito Extermination Commission (these tires had been illegally dumped in a variety of municipalities) and/or accepted from individuals at the MCMUA's Parsippany transfer station. All tires accepted at the transfer stations were shipped to and recycled at Casings, Inc., Hillsboro, NJ. MCMUA 2011 Recycling by the Vegetative Waste Recycling/Compost Facilities - (PDF File) - This report shows the vegetative waste recycled at the MCMUA's two vegetative waste recycling/compost facilities located in Mount Olive and Parsippany-Troy Hills Townships. Lake weed listed in the report can be reported as grass for recycling tonnage grant purposes. MCMUA 2011 Recycling by the Household Hazardous Waste Programs - (PDF File) - This report shows the materials recycled as part of the MCMUA's household hazardous waste program both from the permanent facility as well as the individual disposal days. This does not include bulbs and batteries accepted as universal wastes at the MCMUA's Recycling Consolidations Center. Those figures are included in the first report for the Recycling Consolidations Center. Rechargeable Battery Recycling Corp (RBRC) Rechargeable battery and cell phone recycling report for 2011 (PDF File). Note: all weights on the report are in pounds. (Updated 3/21/12) The tonnage reports below are provided by markets directly to municipalities, though the MCMUA has obtained a county-wide version of these reports. Municipalities are likely to have been sent these reports directly from the market and may have already included the tonnages from these recycling market reports in their own municipal reports. If this is the case, the reports are duplicates of the information towns already have.